Tonight!!! Opening Reception!!! 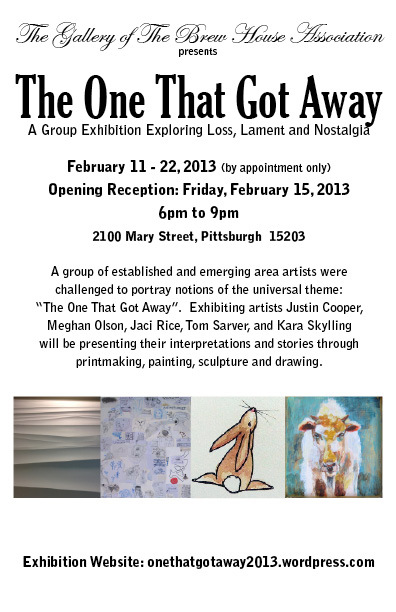 | "The One That Got Away"
The show opens tonight at the Gallery of the Brew House Association (2100 Mary Street, Pittsburgh 15203). Tom Sarver will be spinning records. Beer, wine and light snacks will be served. Free admission. Bring a guest, or two, or three to see some great art from area artists Justin Cooper, Meghan Olson, Jaci Rice, Tom Sarver, and Kara Skylling. If you can’t make it tonight, don’t worry!! Call, email or text Jaci Rice and make arrangements to take a personal walk-through. Contact info can be found at the top right “Contact” in red. ← Show is going up!